Illmatic was released 20 years ago, and is considered a hip hop classic. Time Is Illmatic is the film about this influential record and it’s creator, Nas. It’s more than just a music-documentary, it is a look at Nasir Jones’s life and up bringing. We see an intimate portrayal of what has shaped him into the artist we know today. Music was always in Nas’s life with his father, Olu Dara, being a successful musician. He grew up in the Queens Bridge projects, the type of environment that shaped the vast majority of the black youths growing up in New York. Through interviews with Nas’s father and brother, a vivid picture of how government housing, meant to give all working classes a safe and affordable place to live, soon became a breeding ground for crime. Living in this environment, along with a failing state school system, Nas was faced with limited options in life. In fact, his father advised both him and his brother to leave school in favour of work. Following the death of his close friend “ill will” he decided to pursue the dream of becoming a recording artist with more purpose and determination. The circumstances of what pushed Nas to become a rap artist, and the music that influenced him, is the core of this film. There is less detail about the actual production of the classic ‘Illmatic’ album. There are only very brief interviews with the producers, and people who helped bring Illmatic together. The likes of MC Search, Pete Rock, Q-Tip, DJ Premier and Large Professor are a little underused. In fact, I think they could still make up a whole other documentary on the production of this rap classic. However this film is still a great insight into what influences musical creativity. 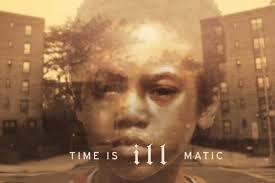 Time is Illmatic is a must for all Nas fans. Director One9 has created an emotional documentary that mirrors the message of the record itself. A true rap coming of age story. Time Is Illmatic is screening 1 – 2 August in Auckland, with other screenings and location found on the NZIFF website.